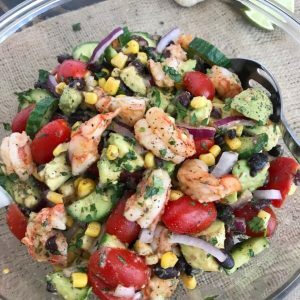 Cilantro Lime Shrimp and Avocado Salad - a salad packed full of vegetables that will become a go-to meal or dish in your kitchen from the moment you try it! This salad is very easy to make, light and refreshing in flavor, and can be made in minutes. The perfect low-calorie meal or side dish if you're looking for something simple and quick. Combine ingredients for the dressing into a small bowl and whisk together until combined. In a large bowl, combine all ingredients until the 'Additional Ingredients' section, tossing in the chopped shrimp and avocado last. Add dressing to the shrimp avocado salad, tossing to coat. Serve immediately. This will keep in the fridge for up to 2 days, but is best when freshly made. Optional: add garnishment, to taste, of additional black pepper, lime juice, and cilantro. *Depending on desired level or tartness, add half (2 tbsp.) of the lime juice at first and once everything is combined - if you feel that you would like a little more, add the remaining 2 tbsp. (or more to taste) and toss.